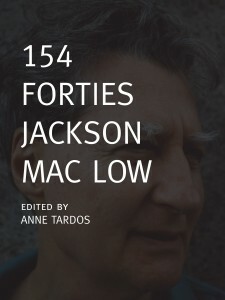 In this book Mac Low turns language away from denotation, as my title, which is a line from one of the Forties, suggests. The poems sound alien because they are precisely not that; what Mac Low is trying to do is be as immediately human as possible, without adding any intervening or mediating narrative. This is the chance operation of tuned mind and ear listening for the strange in everything and composing spontaneous weird music out of those found sounds. The multitude of voices in these poems coalesce under the careful orchestration of Mac Low: it is not completely chance because there is this organizing constraint or music. The reader can forget that the words are attached to anything, which may be best, because that makes it even more exciting and surprising when from the hypnotic chant-like stanzas emerges a fragment of sense, a sentence, a few words that fit together in recognizable order. That little bit of recognition is like the sight of land from your lifeboat. Or, the buena vista at the end of a long climb that makes whatever work you’ve done feel worth it. Like that good look, you have to figure out where the hell you are, find some landmarks, and maybe try to contextualize the work among others. In that way 154 Forties is work; it’s not really pure spectatorial poetic entertainment (I suppose most poetry that gets written about isn’t.) It’s not that the collection is hopeless or hopelessly hard to enjoy; far from it. Just like the compositions by Cage, this work includes a lot of noise and space. It’s ambient instead of directional. The way you will feel about this collection may depend on your proclivity for noise. I would recommend this poetry to someone who enjoys Wolf Eyes, Finnegan’s Wake, Marina Abramovich, and a lot of other things. Nonorthographic acute accents indicate stresses, not vowel qualities. lines continue verse lines begun above them. This collection is not going to offer strong narrative threads or even really themes, moods, clear intentions, or messages. But it creates its own kind of epic; there’s even an appropriately lengthy index. The book is 313 pages long. Each one of the 154 poems (coincidentally the same number of the sonnets that Shakespeare wrote as pointed out by Mac Low’s partner and editor Anne Tardos in the introduction) take on the form of “eight stanzas, each composing three rather long verse lines followed by a very long line (typically occupying more than one typographical line) and then a short line.” (154 Forties, XIII) Mac Low is obviously concerned with not just the aesthetic of sound but also that of print; however, where Mallarme, L=A=N=G=U=A=G=E, and visual poetry seems somehow a departure form lyric, and uncreative writing or appropriation can sometimes feel limited by its own concept, these “forties” are enveloping, friendly to all approaches. wáiting-here Dash Betreten der Bahn anlagen ist verboten! It seems like Mac Low is doing something akin to the curatorial work of Joseph Cornell… or again the ready-mades of people like Duchamp and Beuys. And sometimes, just like when I’m looking at most artworks that are conceptually challenging, I think of this book as a kind of taunt or prank. If Mac Low is saying something, it sounds to me like, “Here’s what an epic looks like in the 1990s. Take it.” In that way it is a very generous work of art. Leif Haven is a writer living in Oakland, where at least it isn’t raining all the time.